Neal Morse is one of the most important figures in progressive rock, even though he didn’t begin recording in the genre until two decades after it reached its peak. As the co-founder, lead singer, main songwriter, and multi-instrumentalist with Spock’s Beard, Morse helped set in motion the revival of progressive rock in the early ’90s, which is still going strong today. Morse is doing just as well today, if not better. His gift at composing complex, lengthy, highly melodic songs with provocative lyrics has never left him in the years since he left Spock’s Beard in 2003. Since then, Morse has produced several top-flight progressive rock albums as a solo artist (working consistently with Mike Portnoy and Randy George), while playing a prominent role in the progressive rock supergroup Transatlantic (with Roine Stolt, Mike Portnoy, and Pete Trewavas). Morse, however, has a clear fondness for classic rock, as displayed to great effect on the two Morse-George-Portnoy albums, Cover to Cover and Cover 2 Cover. In addition, Morse’s two solo albums from the time when he was still with Spock’s Beard were composed of original songs in classic rock and folk-rock styles. So we shouldn’t be too surprised by Morse’s latest release, Songs from November, a blend of classic rock, pop-rock, and folk-rock songs that employs Morse’s talents for melody and thoughtful lyrics in a less feverish and challenging context than his progressive rock work. 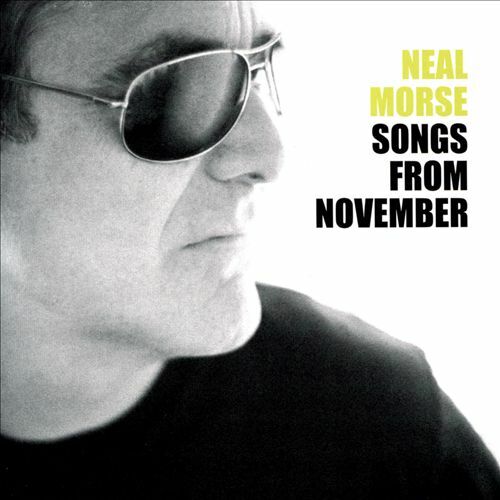 Like his work in progressive rock, Morse’s style in Songs from November hearkens back to the early 1970s, when rock music can arguably be said to have been at its peak, with its great variety of musical styles all accommodating a strong sense of melody and structural logic (virtues that would become attenuated beginning later in that decade with the rise of punk and disco, and have never been fully recovered). The instrumentation, song structures, melodies, and lyrics of Songs from November evoke early-’70s giants such as Paul McCartney, Paul Simon, Cat Stevens, Graham Nash, and America. That is a huge compliment, in my estimation. Opening song “Whatever Days” is bright, upbeat, and anthemic, with a knockout chorus and a cheery coda featuring a catchy saxophone solo. Excellent lead vocals by Morse. “Heaven Smiled” is a ballad, with acoustic rhythm guitars, a passionate vocal by Morse, and a strong vocal melody on both verses and choruses, which employs pauses and broken rhythms to good effect. There is also a gospel-style background chorus in the closing passage. “Flowers in a Vase” is a mid-tempo acoustic ballad, in the style of Graham Nash’s CSNY songs. Morse uses a steel guitar to create a mood that is simultaneously peaceful and somewhat plaintive, illustrating well the lyrics of the song, which depict home and family as a refuge (“my home, my hiding place”) from the myriad problems of life. “Love Shot an Arrow,” another ballad, begins with solo voice and piano, which are then joined by the rhythm section and orchestral strings. The vocal melody of the chorus very effectively employs a descending progression which is rescued by rising tones in the second half of each lyric line. “Song for the Free” introduces a harder, quicker beat with prominent kick drum and electric guitars. The vocal melody of the chorus is strongly reminiscent of Morse’s work for Spock’s Beard in the Beware of Darkness era, and the bridge sounds like Morse’s recent solo work. He sings very passionately throughout the song, without ever sounding forced; the sincerity of his vocal performances has always been a major strength of Morse’s work. In “Tell Me, Annabelle,” the first verses feature Morse’s voice backed solely by an echoey piano playing a simple, rather childlike melody that aptly conveys the directness of the sentiments of the lyrics, in which a father sings to and about his daughter in a effort to help her with her worries, which he is having difficulty understanding. For a subsequent verse the rhythm section kicks in strongly, and other textures such as orchestral strings enhance the mood of fatherly concern and love. “My Time of Dying”: Morse sings passionately about the subject indicated by the song’s title, backed by finger-picked acoustic guitar, solo violin, and bass, soon joined by drums and backing vocals. The beat, rather unexpectedly given the subject matter, is something of a mid-tempo shuffle, and it picks up a bit of speed during the chorus, which employs a memorable melody. The song overall is reminiscent of early-’70s British pop-folk performers such as Cat Stevens and America, and it compares well with their work. “When Things Slow Down” is another ballad with prominent drums and strong vocal by Morse, with noticeable vibrato in his singing of the chorus. Steel guitar provides an additional musical texture. “Daddy’s Daughter” is a McCartneyesqe, midtempo, piano-led ballad. Morse’s distinctive voice has a raspiness that prevents the song from becoming cloying as the lyrics convey heartfelt sentiments of a father’s love for a daughter as she prepares for her wedding. Instead of descending into maudlininess, the song is really rather moving. What could easily have turned into a dud in less-talented hands instead becomes a highlight of the album. “Wear the Chains” stands out from most of the rest of the album, as a mid-tempo rocker with a wide dynamic range, alternating between voice and piano passages and full rock ensemble with string backing. The use of what sounds like a processed electric organ adds an interesting and pleasing textural element late in the song. In “The Way of Love,” Morse gives an unusual and effective bluesy vocal performance on the early verses and a bright, strong vocal presence on the choruses, the latter reminscent again of Spock’s Beard’s “Beware of Darkness” era. The sprung rhythm of the instrumental accompaniment on both verses and choruses is very appealing and strangely inspirational; perhaps it suggests some gospel sounds I can’t quite place. A strong brass accompaniment in the bridge and conclusion adds a texture not previously heard on the album (reminiscent of some of George Harrison’s arrangements on All Things Must Pass, and just as good). The song builds in volume and intensity in the final couple of minutes, creating a rousing conclusion to the album. Packed with gorgeous melodies, impassioned musical and lyrical ideas, and Morse’s benevolent spirit, Songs from November is a great pop-rock album and is as inspired, and inspirational, as Neal Morse’s best works of the past. And if it does even a little to revive a fondness for early 1970s pop-rock styles, so much the better.